This article will help Kloudio users to create reports for leads, opportunities, accounts and much more from their Salesforce accounts. Salesforce is the leading business' command centre in the form of a customer relationship platform (CRM). As such, Sales professionals rely on Salesforce customer data they have to generate more sales. Kloudio offers premium users an easy way to leverage Kloudio's reporting with a Salesforce integration that pull in leads, opportunities, contacts, accounts, users etc. Go to Kloudio Connections and Click the button to create a New Connection. You will see the below screen. Click the Setup button under the Salesforce icon. Enter your Salesforce login information and proceed to Step 2. Now it's time to setup your Salesforce data sync settings. This will enable you to sync your Salesforce data to a database of your choice. Kloudio will do this on your behalf by invoking Salesforce APIs as per your configured sync frequency. 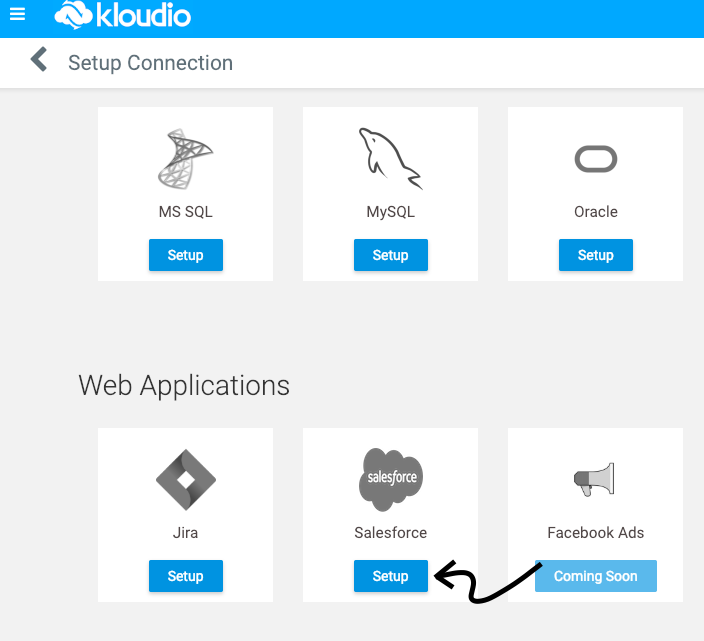 b) Choose an existing database connection: This is where Kloudio will sync your Salesforce data. Once it's synced, it will be available for creating Kloudio reports in builder or SQL mode. d) You can also optionally use Kloudio's data warehouse in case you don't have any data warehouse to sync your data to. e) Click Save & Sync. Once the Salesforce connection is created and synced as per steps 1 and 2 above, you can create reports from leads, opportunities, contacts, users, accounts and more. This is like creating any other report as explained in the help article here for builder mode reports or the article here for SQL mode reports. Please ensure you select the connection and schema as used in the Salesforce connection settings from Step 2. Feel free to chat with us or drop an email in case you have any questions related to this integration.